S10E10 - "The Eaters of Light"
After a few weeks of episodes that weren't eventful enough and abandoned the characters we thought we knew and refused to properly dive into the thematic material they were offering, Doctor Who is back on track, and it's all courtesy of one woman: Rona Munro. Munro is the first writer to serve up episodes in both the classic and revived era of the show, and, if "The Eaters of Light" is anything to go by, she certainly knows her stuff. We begin with a fairly standard opening. 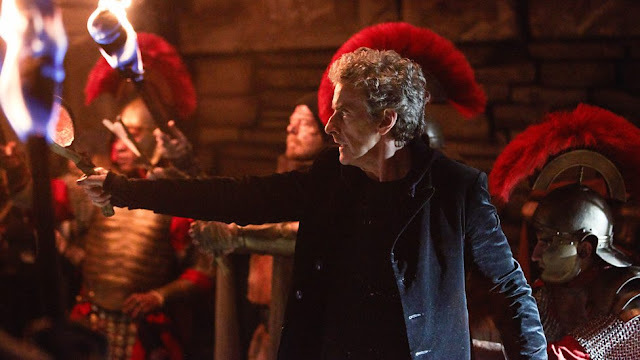 The Doctor and Bill have gone back to 2nd Century Scotland to track down the Ninth Legion of the Roman Army - the Doctor believes the army was wiped out while Bill is adamant it wasn't. They split up to find their answers, but after Bill stumbles across one survivor of the Ninth Legion and the Doctor finds a whole different kind of tribe, it becomes increasingly possible that neither of them will be right about what happened all those years ago. Splitting the Doctor and Bill up seems like a frustrating choice given how underused Peter Capaldi and Pearl Mackie have been for a high percentage of this series, but Munro balances her episode perfectly. It's without question the sharpest script of the series in how it divides the episode into two halves but doesn't let any key cast member fall beneath the surface. For the first time all series, I feel like I watched Peter Capaldi and Pearl Mackie at the top of their games. We'll look at Mackie first. Separated from the Doctor, Bill is forced into trusting other people - something she's learned to do across Series 10. Bill as a character still feels frustratingly underdeveloped but that isn't too big of an issue if she's still likeable, and Mackie simply oozes likeability. She makes Bill fun and giddy - listen to the excitement in her voice when she asks the soldier if he's from the Ninth Legion - but she carries a heavy weight on her shoulders when the table turns. Mackie struggled with the more hard hitting scenes earlier in the series, but she's come a long way - there's real, honest heartbreak on her face when Bill has to tell the other soldiers that Simon has died. It's a remarkable performance, unquestionably Mackie's strongest work on the show to date. On the other end of the episode is Capaldi, who has felt so far separated from the calibre of acting he gave us last year that it's frequently been tough to identify him as the same Doctor we saw in Series 9. This year's scripts just haven't given him the material to work with, but Munro does - albeit subtly. There's no giant speech here, but Munro adds significant depth to the Doctor's words - the wise, thoughtful man we once knew makes a comeback here. The Doctor rousing the two opposing armies to come together is a notably powerful moment, and his potential sacrifice of guarding the gate for all eternity would feel empty in the hands of a lesser actor. It's thrilling to see him on top form again. As well as being terrifically performed, Munro's episode is benefited by a real willingness to tackle the themes it offers. When Bill first begins to understand the TARDIS translation trick it feels like a fun little throwaway, but Munro soon transforms it into something infinitely more powerful. "The Eaters of Light" tackles the futility of war in a quiet way, looking at something as simple as understanding your enemy's language and how that can change your whole perspective. The notion that when you can understand the whole Universe everyone sounds like children is a moving sentiment, and one that fits the Doctor Who brand perfectly. Munro even plays it through to the endgame, as two rival tribes come together to defend a force more powerful than them both. After last week's under baked look at war, Munro hits the nail on the head. It's exactly what's been missing from Series 10, an episode of strong performances and nuanced ideas that understands show to shine a spotlight on them both. "The Eaters of Light" isn't the strongest episode of the series - supporting performances are questionable and there's a few too many moments that don't quite add up - but it brings the show back to reliable ground before it heads into what promises to be a delightfully weird and over the top finale. Doctor Who hasn't been operating on the same level this year as its past two seasons, but "The Eaters of Light" is an episode that stands high in the Capaldi era if only for how it lets the man be himself again. It's about damn time. Can Rona Munro become a regular writer for this show during the Chibnall era? I'd love that. This episode was gorgeously directed, too. Charles Palmer relishes in both the night and the day, capturing the scenery with beauty. Nardole remains a highlight of this series. From his popcorn antics to his Scottish accents, Matt Lucas has been effortlessly enjoyable in every last scene. I was sceptical to his presence this year, but boy was I wrong about that. "She's not a soldier, she's an embryo. What are you gonna do, throw your action figures at them?" Missy is proving better used this year than ever. Next week's penultimate episode looks very Missy-centric, here's hoping it lives up to what we've seen of her so far. This was probably the last outright standalone episode we'll have with Capaldi in the TARDIS, so what a treat to end with something inherently Scottish.